Throughout the history of Buddhism, few philosophers have attained the stature of Dharmakirti, the "Lord of Reason" who has influenced virtually every systematic Buddhist thinker since his time. Dharmakirti's renowned works, written in India during the philosophically rich seventh century, argue that the true test of knowledge is its efficacy, and likewise that only the efficacious is knowable and real. Around this central theme is woven an intricate web of interrelated theories concerning perception, reason, language, and the justification of knowledge. Masterfully unpacking these foundations of Dharmakirti's system, John Dunne presents the first major study of the most vexing issues in Dharmakirti's thought within its Indian philosophical context. Lucid and carefully argued, Dunne's work serves both as an introduction to Dharmakirti for students of Buddhism and a groundbreaking resource for scholars of Buddhist thought. "On the basis of thorough philological work, John Dunne presents the essentials of Dharmakirti's ontology, epistemology, and logic in philosophically informed language with an admirable capacity to interpret even those more difficult aspects of Dharmakirti's thought with easily readable clarity. His interpretation is conscientious of the context, well-documented, and Dharmakirti's problems are carefully analyzsed. The book promotes our understanding and, at the same time, can serve as a lucid introduction to one of the most important philosophers of India's past." "A comprehensive introduction. Dunne renders comprehensible some of the most basic and also challenging features of this seventh-century Buddhist thinker's thought. He also provides a fascinating analysis of commentarial practices and the problems posed in attempting to forge an intellectual history for Indian Buddhism." "A milestone in the modern history of Dharmakirti studies. Dunne thoroughly examines the achievements of previous scholars in the field, presents his own answers to the various questions related to Dharmakirti's philosophy, and suggests what problems are yet to be solved. Apoha theory, one of the least-investigated subjects of Buddhist logic and epistemology, is beautifully explained. A brilliant work!" "This volume is both an in-depth introduction to and a historically oriented interpretation of the thought of Dharmakirti, the seventh-century South Asian philosopher. 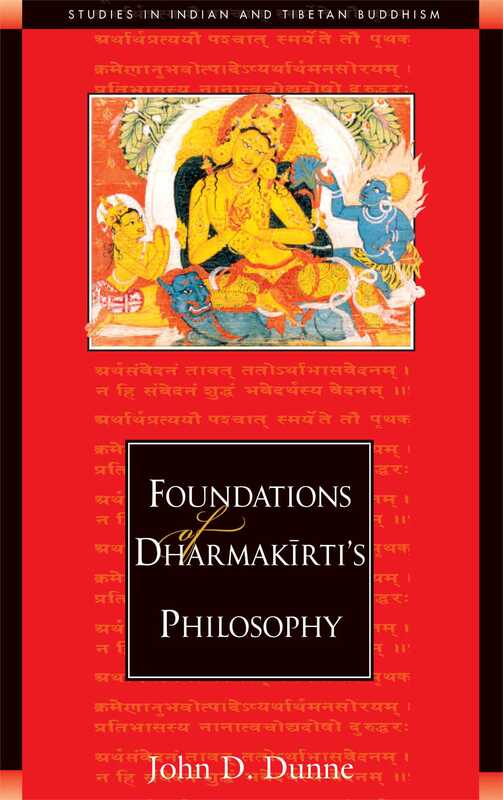 'Foundations' in John Dunne's sense are fundamental elements of Dharmakirti's conceptual system that make his arguments possible. His study is based on Dharmakirti's earliest work, the Pramanavarttika, and his autocommentary on the chapter on 'inference for oneself,' with occasional forays into later treatises, especially the Hetubindu. As a point of departure, Dunne chooses the oldest stratum of commentarial interpretation by Devendrabuddhi and Sakyabuddhi, which is available only in classical Tibetan translations... This study is notable especially for the breadth of textual material that it covers... Dunne presents occasionally surprising new interpretations that will no doubt shape future scholarly debates." "Dunne displays a mastery of primary and secondary sources, and, given the semantic fluidity of Sanskrit technical terms, an admirable stylistic consistency.... Foundations of Dharmakirti's Philosophy stands as one of the most innovative and sophisticated attempts to engage with Dharmakirti's project in a systematic way."